Yorkshire pudding recipes are technically not "dessert recipes," but because so many visitors have requested them, and because they taste almost as good as dessert when served with roast beef and gravy, I've included them for your enjoyment. Make light, deliciously crisp puddings that you'll be proud to serve at your dining-room table. It's the only traditional side dish for roast beef. The following Yorkshire pudding recipes follow the traditional method of baking a large pudding in a greased baking pan or a casserole and cutting it into squares when done. However, you can easily make individual puddings by pouring the batter into ordinary muffin tins. 1 cup sifted flour, 1 teaspoon salt, 2 eggs, 1 cup skim milk, 1/4 cup beef drippings. Sift together flour and salt; beat eggs until thick, add flour and 1/3 cup milk, beat till flour is moistened; add remaining milk, beat till mixture is free from lumps. Pour drippings in 2 quart casserole, do not stir. Pour batter into casserole and bake in hot oven (450°F) 30 minutes or until puffed and well browned. Pour 1/4 cup beef drippings into 9-inch square pan. Heat in oven until the drippings begin to sizzle. Meanwhile, beat together 2 eggs, 1 cup sifted flour, 1 cup milk, and 1 teaspoon salt. Pour batter over sizzling drippings and bake in 450°F oven for about 20 minutes. 1 pint milk, 6 ounces flour, 2 eggs, 1/4 teaspoon salt, 1/2 teaspoon baking powder. Put the flour in a basin with the salt, and stir in the milk gradually. Beat up the eggs and add to the batter when quite smooth. Allow to stand 2 hours, then add the baking powder and pour mixture into a well-greased baking pan. Bake one-half hour. 3 eggs, 5 tablespoonfuls flour, 1 pint milk, 1 large onion, pepper and salt to taste. Beat the whites of the eggs to a stiff froth. Mix the yolks with the milk, flour, and condiments. Lightly mix in the whites and pour into 1 or 2 well-greased pudding tins which have been made hot. Bake 20 minutes. The pudding should not be more than 3/8-inch thick and should be of a nice brown color. —Mrs. Thornton Blakely, Bloomfield, Ont. 1 cup flour, 1/2 pint milk, 2 eggs. Put the sifted flour into a basin, drop in one whole egg, add a little of the milk, then another egg, and more milk, beating well between each. Beat at least ten minutes and allow the batter to stand some time before cooking. Dr. Chase, fondly known as "The Old Doctor," presents a traditional English recipe, then offers an easier method of preparation in his "Remarks" below. Sweet milk, 1-1/2 pints; flour, 7 tablespoonfuls (as you lift them up out of sifted flour); a little salt. Directions: Put the flour into a basin with the salt and sufficient of the milk to make a stiff, smooth batter (that is, to be no lumps); then stir in two well-beaten eggs and the remainder of the milk; beat all well together, and pour into a shallow tin which has been previously rubbed with butter. Bake for 1 hour; then place it under the meat for 1/2 an hour to catch a little of the gravy as it flows from the roasting beef. (This is the English way, where they "spit" the beef in roasting. See remarks below for the American way, and also about serving on a napkin.) Cut the pudding into square pieces and serve on a hot folded napkin with hot roast beef. —Warne's Model Cookery, London, England. Remarks. —The plan of putting the pudding under the roasting beef, where they roast it upon spits (a pointed bar of iron, or several of them, to roast before a fire), as your grandmothers used to roast a goose, turkey, or sparerib, was a very convenient way of moistening the top of the pudding with the rich juices of the beef. But in place of that we, here in America, have the pudding 10 or 15 minutes longer in the oven, but baste it frequently during this time, with the meat drippings; make this pudding only when we are roasting beef; and we serve it upon the plates with the beef, and not upon napkins, which makes too much washing for our wives and daughters. In England, with plenty of "servants," they care not for this extra work. Make a batter of 6 eggs, 3/4 pint of milk, and 1/2 pound of flour. Beat well and pour into a shallow pan. Fill with 1 pound of steak and 1/2 pound stewed kidney, cut in slices, and 1 cup of stock. Lay the rest of the batter over. Bake 3 hours. Serve hot. This is really an entree. These do not taste of parsnips at all, and can be found still in the little country farms or cottages. Boil 3 parsnips until tender, mash and press through a sieve, mix in proportions of 1 teacupful to 1 quart of hot milk, 1/2 pint of yeast, some salt, and flour to make a stiff batter. Cover, set in a warm place, and when risen to twice its size, knead into flat cakes, very thin. These must rise again and be baked until brown. 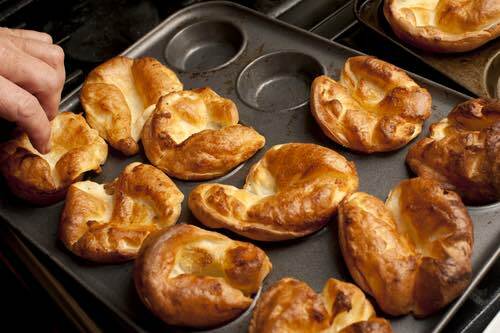 Can be eaten with butter, like crumpets or scones, or with gravy, like Yorkshire pudding, with a roast of meat. The first mention of Yorkshire pudding appears in Hannah Glasse's The Art of Cookery Made Plain and Easy published in 1747. This simple English batter pudding made of eggs, flour, milk, and beef drippings is tasty with any meat dish, but it's traditionally served with roast beef and gravy. Large Yorkshire puddings were once cut into squares and eaten with gravy before the meat course, but nowadays individual puddings are often made and served with the meat as part of the meal. These old fashioned puddings are so good tasting that you'll love to eat them anytime.